In several of the palettes there are fields to enter numbers. The number in the field will change the size of text, brush size, percentage of opacity, flood fill tolerance, etc. 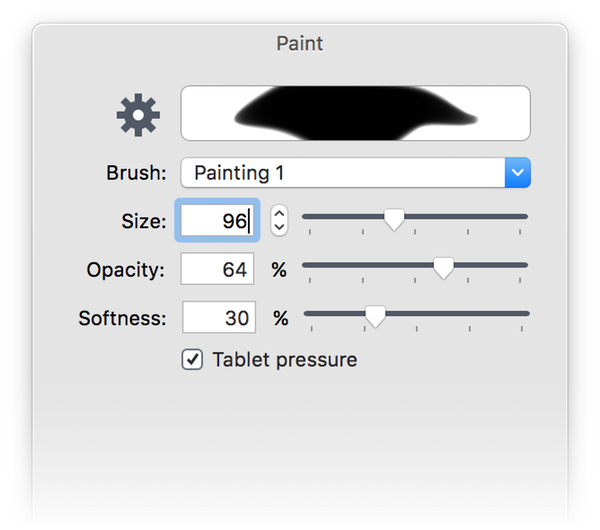 This example will use brush size. Below is a shot of the Inspector Palette showing the paint options. There is a field for you to enter a number (now set at 63). Next to that are up (▲) and down (▼) arrows to adjust the size, and to the right of the arrows there is a slider. You may also wish to change the number in the field by clicking inside the field, and using the up and down arrow keys on your keyboard. As you do this, notice the slider will move according to the number in the field. Holding down the option key in the numerical input fields when using the up and down arrows will change the value by .1. Holding down the shift key will change the value by 10. The exception is in the field for text size. When you click on the arrows to the right of the text size field a drop down menu will appear.